Crowdfunding occurs when people network through the internet to raise money to support other people’s ideas or interests. Crowdfunding became popular when Obama signed the JOBS Act bill in April. Since then, sites like Fundable and Kickstarter have garnered media attention. Not all information about crowdfunding has been positive. The Harvard Business Review’s article The Road to Crowdfunding Hell explained some of the problems associated with the process. The concern is that there is a lot of interest without a lot of control. “The association of securities regulators says the JOBS Act doesn’t do enough to protect investors.” Crowdfunding Insider claims Education is the Best Weapon Against Crowdfunding Posers. The following video explains: The JOBS Act and its impact on crowdfunding. Enron – Questionable accounting practices and manipulation of the energy supply brought down this company. Enron: The Smartest Guys in the Room is an excellent documentary movie that explains the scandal. 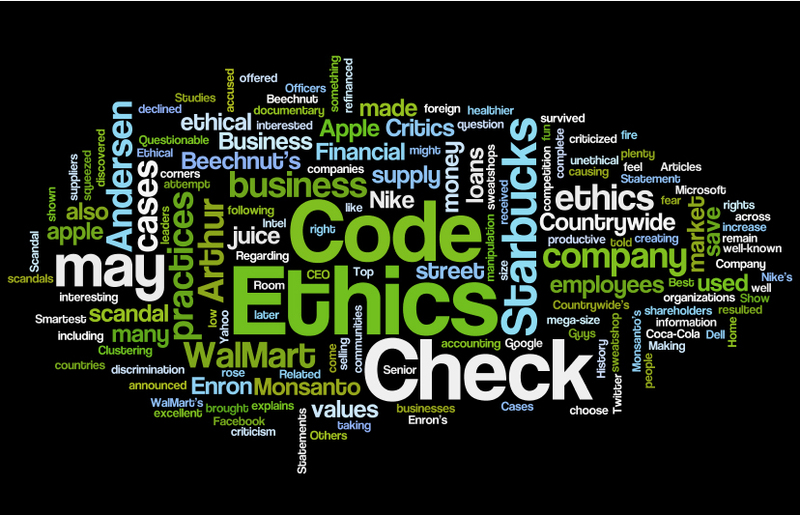 Check out an excerpt from Enron’s Code of Ethics. Monsanto – Monsanto has been criticized for its mega-size. Critics fear they are taking over the food supply as well as creating negative environmental issues. Check out Monsanto’s Code of Ethics for Chief Executives and Senior Financial Officers. Arthur Andersen – Arthur Andersen is known for its unethical auditing practices. Check out The Fall of Arthur Andersen for more complete details. WalMart – Studies have shown that WalMart may save people money but they may also negatively impact communities. Their low prices may also hurt suppliers. The company received criticism when leadership announced they wanted to hire healthier, more productive employees. WalMart has been accused of being anti-union and has survived sweatshop and discrimination scandals. Check out WalMart’s Statement Regarding Code of Ethics. Countrywide – The company offered subprime loans that later resulted in default. Critics have claimed that Countrywide employees told clients that their properties would increase in value and that their loans would be able to be refinanced when market values rose. The market values declined causing many to lose their homes. Check out Countrywide’s Code of Ethics. Beechnut – Beechnut’s ethics came into question when it was discovered that they were selling “apple juice” to foreign countries that contained something less than apple juice. For more information on this scandal, check out Beechnut’s History and Apple Juice Scandal. Starbucks – Clustering strategy may force smaller companies out of business. There were so many Starbucks on street corners that movies like Best In Show made fun of how there might be one Starbucks right across the street from another. Check out Starbucks’ Code of Ethics for CEO and Financial Leaders. Nike – Manufacturing practices included producing shoes offshore to save money. Nike has used its share of sweatshops in manufacturing. They have come under fire for human rights violations. Check out Nike’s Code of Ethics. Code of Ethics for: Amazon, Apple, Dell, Facebook, Google, Intel, LinkedIn, Microsoft, Twitter and Yahoo! Business Ethics: Ethical Decision Making & Cases – For more business ethics cases including Coca-Cola, Tyco, PETCO and Home Depot. In a foresight class I teach, we compare Al Gore‘s and Glenn Beck‘s views on global warming. It brings up some interesting discussions. A student recently posted this link in class and I think it is very well done and explains the two sides and how we may need to think about the subject. With the current state of the economy, many companies are barely making ends meet. They are low on funds and are finding unfortunate ways to stay afloat. One of those ways is through grinding their present and past employees. What is grinding? Think of the salesperson who is owed a commission from a company but they decide to quit and go somewhere else. Let’s say the company owes them $20,000 in back commissions. The ex-employee is still entitled to their commission. However, some companies may not have the funds or don’t want to pay the commission and stall on the payment. Meanwhile, the ex-employee is feeling the pain of not having their money and is constantly contacting HR or leadership to find out when it’s coming. Unfortunately many of these companies play this game for many months before people end up going to lawyers. The company is betting the ex-employee won’t seek legal representation and even if they do, the corporation has the legal power and funds on their side. The company may get a threatening letter from lawyers but they know that they have the upper hand and hope that the ex-employee will give up over time, because they will run out of money and patience. The ex-employee has a better case if they can find others who are not receiving their payments either. By all of them getting together in a class action suit, their power is increased. It is illegal for companies not to pay money they owe. Technically there are labor relations boards that handle complaints. However, after checking with the local Arizona state labor office, they only will help you with your claim up to $2500. For a list of state labor offices, please click here. In Arizona, if your claim is under $2500, they will investigate it and it can take up to 90 days to be resolved. If your claim is over $2500, they won’t even look at it. It is then up to you to go through the civil courts which means lawyers, money and time. . .Things that the corporations have on their side. A scraper site is a spam website that copies all of its content from other websites using web scraping. The purpose of creating such a site can be to collect advertising revenue or to manipulate search engine rankings by linking to other sites to improve their search engine ranking. There are now some sites that are working on finding out even more information about you through scraping. PeekYou.com has applied for a patent for a way to, among other things, match people’s real names to pseudonyms they use on blogs, Twitter and online forums. In a recent article in the Wall Street Journal, they wrote about how scrapers broke into sites like PatientsLikeMe to find out information about patients to sell data about consumers to drug makers. To read this very interesting article, click here. It is disturbing to think that people are in medial chatrooms pretending to be patients in order to find out what drugs are being prescribed. That kind woman you are chatting with about your hot flashes just may be a guy keeping track of your medical history. For information on how to remove some of your personal details from the Internet, check out wsj.com/wtk. 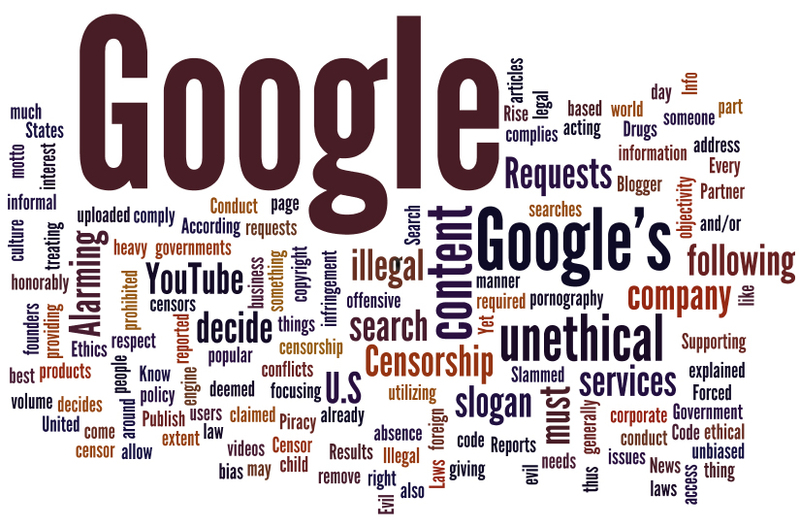 I teach several different ethics courses where we look at individual companies and how they handled ethical issues. Beech-nut selling a product they called apple juice that technically had no apples in it, was a classic case example of a non-ethical way to do business. In the 80s, Johnson and Johnson had to deal with tainted Tylenol (The Tylenol Murders) due to product tampering. Their quick and responsive resolution to a potentially imagine-ruining situation has made J&J stand out as a good example of an ethical business. In my entrepreneurial and foresight classes I teach, we often talk about how some seemingly wonderful or harmless inventions have unintended results. I often refer my students to a “Stuff You Should Know” podcast about Agent Orange. If you are creating a product or idea, have you considered all future consequences. I highly recommend reading Jacob Silverman’s article at: http://www.howstuffworks.com/agent-orange.htm. Rather than address the causes for ethical problems, companies too often simply create a filter for trying to catch infractions. This reactive approach failed in addressing total quality, and will fail in addressing quality in ethical orientation. We now have over twenty years of experience with formal ethics structures in business. By and large these have become one-dimensional programs for delivering compliance, with very little impact on actual business strategy or corporate culture. Enron was touted as a paragon of ethical practices even while its executives plundered shareholder value, and its employees adopted ever more ruthless personnel policies. It is important to realize that such failures are not simply from rejecting ethics, but rather from misapplying them. In many ways the whole business ethics culture is at fault. Voluntary codes are not rigorous enough. Structures like ethics or integrity offices have become largely legal services grappling with compliance. Rarely do Boards or strategic planners accord ethics the serious consideration given to finance or marketing. And whistle-blowing systems have been adopted without protecting those who take the risk to do the blowing. Business ethics too often pivot on a business case: tolerated for contributing to reputation or protecting against fines, but considered optional if there is a cost to ethical adherence. Adopting formal codes as a tactic rather than as a strategy, assuming rules will catch mistakes rather than addressing the underlying beliefs, motivations and culture. Managing ethics as a legal or PR variable rather than creating an operational culture that invites the hard questions and uncertainties of moral dialogue. Instituting systems of accountability to more clearly assign blame rather than to give more depth to the fiduciary duties for care, answerability and due-diligence. Defining ethics principles as a top-down or internal exercise rather than by means of a dialogue with stakeholders, critics and those impacted by corporate activities. Assuming that generic terms are enough to inspire employee adherence rather than interacting with them to discover the precise implications for values, attitudes and behaviours. Downloading ethical responsibility on employees as a parallel deliverable to business results without providing the tools, skills or leadership for effectively managing the conflicting objectives or ambiguities. Introducing whistle-blowing structures without creating the culture that supports dissent and rewards those who take stands based on ethical principles. Making ethical commitments without introducing the hard measures for evaluating and tracking the specific dimensions of trust and integrity. Embracing ethics programs during crisis or scrutiny without unlearning the habits and values that contributed to impropriety in the first place. Regarding ethics as a binary option without realizing that it is actually a process of constructive and iterative transformation that actually extends and enhances strategy. I teach several ethics classes. I think this is a good article written by the Center for Ethical Orientation. Many of my master and doctoral students are considering starting their own businesses. It is very important to have a strong code of ethics set up from the beginning and to be sure that this message is being delivered.